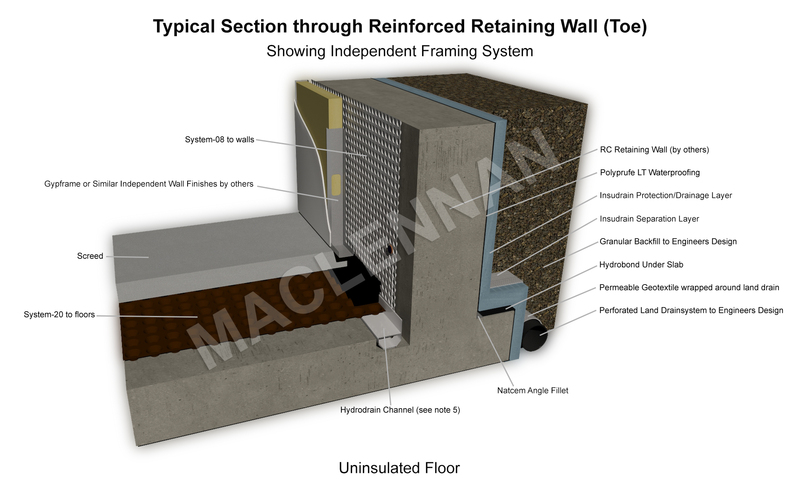 The MacLennan cavity drain system is an internal lining system which provides a cavity through which water will pass. The system consists of a profiled plastic wall membrane which drains to a plastic drainage channel (sited at the wall floor junction) and a profiled plastic floor membrane. Further to this sumps and pumps will also be required if natural drainage is not available. BS8102 requires that all waterproofing is maintainable and repairable. How do you comply with BS8102? The advantage of this Cavity Drain Membrane systems are that they are easily repaired, also quickly and easily maintained, They do not impose any load onto the structure (particularly important when dealing with older structures). Regularly used to re waterproof failed external systems and waterproof concrete. System can be guaranteed for 20 years. Installed after the basement construction. 10 year GPI insurance guarantee. Very flexible accommodates any movement. Very fast track to install and there is no drying period. Can deal with flood water. Call our qualified and experienced design team to discuss your project 08456587777. - Showing Head Of Wall Blockwork. Typical detail through base of retaining wall.